In a joint venture with the University of Delaware, The Delaware Contemporary is pleased to announce cusp, the 2019 University of Delaware Master of Fine Arts Thesis Exhibition. Defined as a point of transition between two stages, cusp encompasses the state the artists currently exist in, poised to enter the contemporary art world. This capstone exhibition leads them through this transition after two years of experimenting and developing formal studio practices within the supportive space of graduate school. The presented work draws on their research and embodies their unique perspectives on contemporary culture and life as they embark on a new journey of emerging fine artists. Tim Austin's ceramic sculptures are canvases for his experimentation in the chemical processes with clay. Technically skilled and always pushing the boundaries of the medium, Austin works to develop custom glazes and slips for his sculptures, allowing the surfaces of the work to become the focal point, and ultimately more important than the form itself. Camilo Cárdenas' sculptures, films, and animations explore cultural identity while reimagining our personal and collective subconscious. Using photographs and videos of family and life experiences as source material, the work manifests itself as reinterpretations of these events, existing in a grey space between the past and present. Drawing from their lived experience as a first generation Cuban-American lesbian, Mariel Garcia's expressive paintings and drawings are developed through a stream-of-consciousness process. These vivid text-based works form a visual journal of Garcia's "quest for God in my first language; art making." Natalie Hutchings' multidisciplinary work focuses on speculative futurism through objects, ideas, and performance. Using a toolbox that includes anthropocene theory, memes, scientific experimentation, neo-wave aesthetics, and humor, she creates alter-ego personas that investigate our collective vision of a dystopian future. Each of these personas help answer the questions Hutchings purposes through their unique perspectives and experiences in the near future. Donte Moore uses his years of training in traditional wheel-thrown and hand-built ceramics to create larger than life abstract biomechanical sculptures. Through these sculptures, Moore investigates ideas of human perfection versus machine perfection and aims to question the absence of heart and soul in the everyday objects with which we surround ourselves. Benjamin Lee Sperry is a mixed media artist who works primarily in screen-printing, painting, and photography. Using process as a starting point and a structure in his work, Sperry layers photographic images with color blocking and varied textures to explore his curiosity in the overlooked and unseen. Mafe Valero is a photographer and performance artist whose work explores themes of identity in ephemeral, fantasy settings. Pulling source material from fragments of dreams and memories, her work manifests itself into surreal situations that leave space for the viewer to project their own experiences and memories, all while exploring what is meaningful to Valero. Sam Whalen's drawings and paintings explore the relationship between objects, images, and the viewer. Working from photographs and using blind contour drawings as a basis of her practice, the works exist as a record of where her eyes have traveled, rather than a copy of what she has observed. Through these abstracted images, Whalen pushes the viewer to explore ideas of conformation bias and how our personal interpretations can vary widely. Jacob Zimmerman's sculptures and installations reflect his travels throughout America and his thought reactions on the value of manual labor. 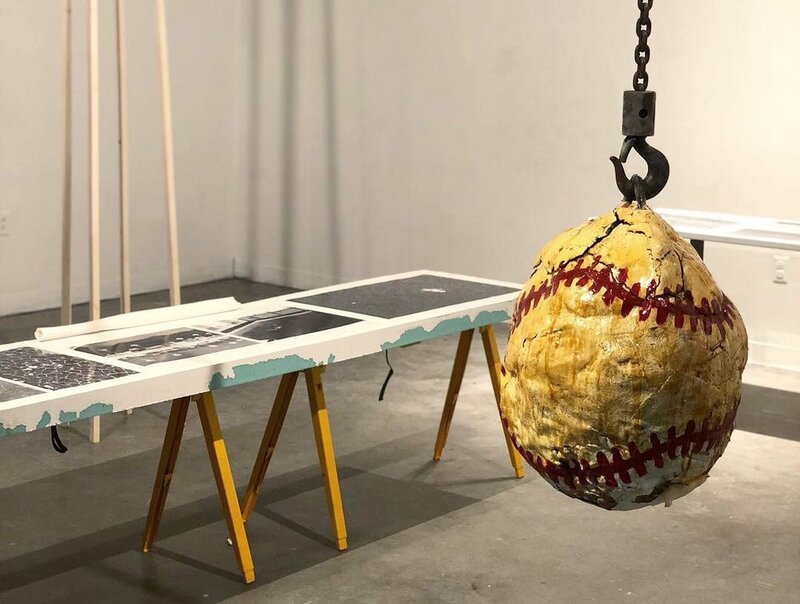 His obsession with materiality leads him to work in a variety of mediums including wood, foam, resin, steel, chalk, photography, and found object as he explores the American identity and reinterprets the American landscape. 96 Sitars is an experimental free jazz group from Magnolia, Delaware. Clint Takeda co-founder of Bardo Pond and has been developing his psychedelic rock art performance persona, Double Wig, for the last 4 years. Aaron Igler is a Bardo Pond alumnus and multi media artist who has performed and exhibited locally as well as internationally.